After 75 years of experience with the Investment Company Act, improving investor protection remains an ongoing, multi-faceted, and frustratingly elusive endeavor. Certain regulatory approaches have been more - or less - emphasized over the years, but today we still lack an agreed-upon singular “silver bullet” for assuring investor protection and must, of necessity, pursue an ever-evolving, eclectic approach to that central policy goal. This chapter describes the various approaches taken to investor protection since 1940 and argues that moving on many, admittedly imperfect, fronts is the best regulatory strategy today and probably the only politically viable one in any event. Board-centered, investor-centered, SEC-centered, and market-centered solutions are all flawed standalone responses, and each of the four can be incrementally improved, but unless broad consensus forms around emphasizing only one or two approaches, investors are best protected through a medley of efforts. Given the dynamics of today’s mutual fund industry, regulatory stances must be adaptive and diverse, with each of the four approaches working in tandem with, not in opposition to, the others. All four approaches to investor protection are both understandable and faulty. A board-oriented approach should be retained but with a reconceived vision of the mutual fund board as the investors’ representative, pure and simple, not truly a “company” governance body. This is because, unlike the traditional business corporation, mutual funds are not operating companies but are collective action mechanisms, and mutual fund governance is not “board-centric” but is “advisor-centric.” The organizational structure of a fund, in which fund assets and management assets are housed in separate vehicles, when coupled with ease of investor exit, undoubtedly makes the mutual fund board far less effective than analogies to corporate governance suggest. As to investor-oriented approaches, the redemption right will always be the most robust investor protection mechanism, but it tends to be a backward-looking ex post solution, and many investors demonstrably stay in high-fee funds, notwithstanding cheaper options offering equivalent returns. 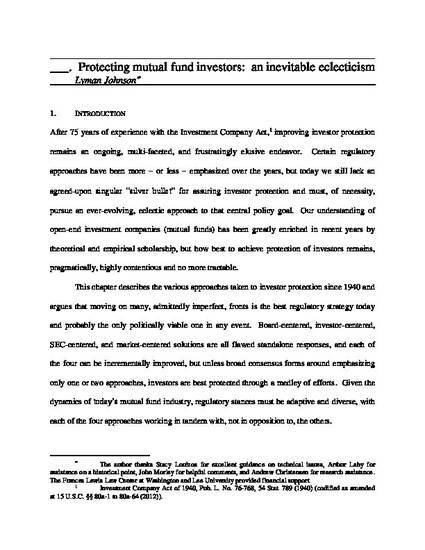 Investor-oriented options can be incrementally improved, however, with the key policy issue being whether §36(b) should be substantially bolstered or remain only of ex ante force, with a candid acknowledgement that it currently affords scant hope for meaningful ex post remedial relief. SEC-centered regulation can substantively curb new abuses and offer both guidance to, and investigations of, directors and advisors, and provide agency enforcement on behalf of investors that goes well beyond § 36(b). And although market forces are constrained in some ways, industry competition is not insignificant, and recent investor migration toward passive, low-fee funds mitigates somewhat the concern over fund expenses, a central concern in the quest for investor protection. William Birdthistle & John Morley, eds.